Welcome to the Ah Ha! Shops blog. Here, you'll find in-depth information on the latest products that range from fun T-shirts to terrific tote bags. In between, there are great gift ideas for everyone in the family. It's all about finding the perfect item - or a perfectly fun accessory! If you're looking for everyday gear, special occasion ideas or are filling a holiday gift list - we think you'll find something here. In the process, we've selected a variety of companies to provide product. Each has its specialties and that's why you may be visiting more than one vendor with our displayed items. It's the best way, we believe, to bring you the highest quality items. You can even personalize some items if you wish. GatorSports is our branded line of unique apparel and other gear. If you're a gator-lover, then you'll want to stop by and Grab a Bite (or, rather, grab a T-shirt, apron, tote bag or dog tank top). For pups of all sizes, you'll find soft-as-cotton apparel in pink, lilac, mint, blue, white, and heather. Humans will love our apron selection. For adults, we have long and short styles with pockets. Kids can have their own aprons for helping out in the kitchen or protecting clothing during painting activities. Shirt styles range from tees to baby dolls and we have hoodies for the winter months. Many of these feature a logo left chest front and full distressed graphic on the back. Choose a "Gotta Get A Gator" or a "Have A Bite" design. Our adorable little one-piecers feature a fat little bear with eyes gazing upward in remorse for the honey jar lying on its side. With paws behind back and such a winning expression, who can really place the blame for making a mess? Color choices include pink, blue and white for ages 6 months, 12 months, 18 months and 24 months. This will be a "honey" of a gift for any little one or mom-to-be. 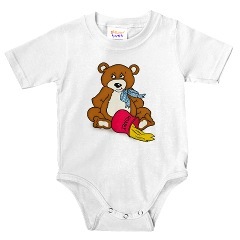 Be sure to check out matching bibs and infant/toddler T-shirts - create an entire package of stylish apparel with this sweet little bear. From the artist, Cindy Kennedy: "Bears are so much fun to create; it's a relaxing treat for me to sketch out faces and bring new personalities to life. They've taken many forms over the years and it's always a treat to come up with art that makes everyone go "awwwwww." In its original form, I created this honey bear as a newspaper announcement for my niece's birth. Over the years, it's shown up on cork bulletin boards and other gift items. What a treat to recreate one of my favorites on infant apparel! Stay tuned for more whimsical bears to appear in this line I call "Bunches of Bears." Will Fish for Food - doesn't that say it all? If you fish - or know someone who "brings home the bacon" when out on the water - these are for you. We have T-shirts, aprons, tote bags and mugs in two sizes. They'll make terrific gifts for bass fishermen (and women). 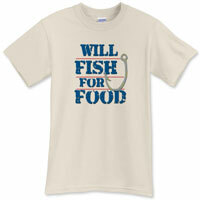 Our Will Fish for Food tees are available in a variety of great colors. Totes feature distressed lettering and a fish hook on both sides. White ceramic mugs with the same imprint are also two-sided. So, even if you fish and don't catch, they're still fun to collect! Put these on your list for holiday or special-occasion gift giving or snag any of them just because they're must-haves. Are ya' still on hold? Well, here's something to sip on while you're waiting for the next available customer service representative. Grab a cup of whatever and settle back - why stress out? Oh, yeah - because you're on hold! On the other hand, this is a great time to put your multi-tasking talents to good use. 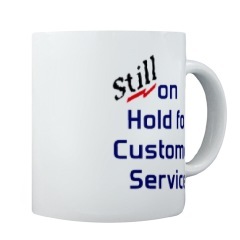 Ceramic coffee mugs state "Still on Hold for Customer Service" in bright gloss lettering on both sides, so there won't be any doubt what you're doing from any angle. Great for both lefties and righties, of course. Even better, they're available in two sizes, so you can enjoy a thick steaming mug of hot chocolate if the wait goes from morning into the afternoon. Mugs are available in large and small sizes - perfect for tea and coffee. At the office or at home. Chile pepper lover, that is. 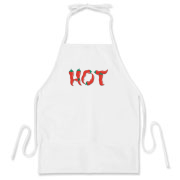 Grab yourself this great apron with chile peppers spelling out H-O-T and there won't be any doubt which side of the mild/wild side of life you're on. It comes in white and is a one-size-fits-most. Great for guys and gals who love to turn up the heat on everything they eat! Check back here for other great gear in our Hot-Heads line! Texans are mighty special - and this T-shirt proves it. 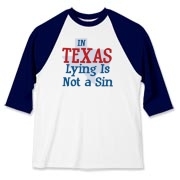 Yep - in Texas, lying is indeed not a sin. Just sit a spell with any native Texan and you'll see what we mean. So, if you know a really born-and-bred, a displaced, or a wannabe Texas, this shirt's for them - and you should go ahead and snag one for yourself. Of course, those God-given rights aren't limited to lying. Check back for more Texas Tees that will surely make the perfect statement. You can see more options for this T-Shirt here. If you like it hot, chill out with this cool mousepad. 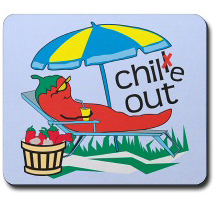 It features a blazing red jalapeno pepper character chillin' on a lounge chair with drink in hand. A blue background, beach umbrella and a bushel basket full of hot peppers - what more could you want on your desktop? When you first receive this mousepad, the surface feels a bit stiff in moving the mouse around. Don't worry, just run your mouse over it for a short time. Colors are sharp and bright. This design is part of the Hot-Heads line at Ah Ha! Shops. And it's only $12.99 for this custom design.